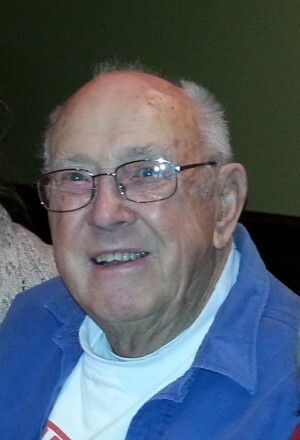 FULTON, NY – Clayton W. Brewer, 87, of Fulton, passed away Tuesday December 29, 2015, at Crouse Hospital in Syracuse. A native of Fulton, Clayt had owned and operated Brewer and Brewer since 1947. He had served as a legislator in Oswego County for more than 30 years and was Highway, Health and Ways and Means chairman. Clayt was an avid race fan, a member of the “Indy Bunch” and founded “Claytona” Quarter Midget Race Track in Volney. Clayt was a member of Fulton Elks Club, Fulton Polish Home, Fulton Masonic Temple and Pathfinder Fish and Game Club. He also enjoyed snowmobiling in his younger days. He was predeceased by his wife, Mildred “Jeanie” Brewer, who passed away January 24, 2012. Clayt will be greatly missed and forever loved by his children, Bonnie (Bob) MacIntyre, Jean (Mike) Bessette, Clayton II (Patti Arnold) and Becky (John Nauss) Beeman. ; 12 grandchildren; 13 great-grandchildren; son-in-law, Marty Beeman; four-legged beloved babies, Gordie and Simon. Services will be held 10 a.m. Saturday, January 9, at Foster Funeral Home, Fulton. Burial will be at Fairdale Rural Cemetery. Calling hours will be 4 to 7 p.m. Friday, January 8, at the funeral home, 910 Fay St., Fulton. In lieu of flowers, Clayt’s family suggests contributions be made to Oswego County Animal Welfare League, P.O. Box 442, Fulton, 13069. Are thoughts and prayers are with you all…to a great man and agreater friend “Smilely” so long for now!! He was a very nice man and he will be missed dearly at brewers. I loved the way he joked around. An icon of the community and a friend I will dearly miss, there are no words to convey my sorrow. Sorry for your loss. Prayers and blessings for him and the family. Clayt was a good man. I haven’t seen him much in the past 20 yrs but I do remember him being so nice whenever I got gas there or went into the garage. He always gave my kids lollipops. Bonnie, Jeanane,Clayt and Becky, I am sooo sorry for your loss. Our deepest condolences to all…. We will miss him dearly…..
A great man and friend who had a heart of GOLD. Our thoughts and prayers are with the entire Brewer family. Until we meet again. If there was a biography of Clayte Brewer I it would be a top ten best seller. My sincerest condolences. So Very Sorry for your loss – and ours! Clayt was always there when we needed him, no matter the time, no matter the weather – we could always count on him. They don’t make ’em like that any more! He will be missed! It’s hard to believe Clayt is gone, I still expect him to come out and pump my gas at Brewer & Brewer. When he got the “Claytona” built they tried to use it against him in the next election and it failed miserably, because everyone knew he did it for the kids. He was a character and there will never be another one like him. My deepest condolences to his family, they can proud of how many people he helped and the smiles he brought to so many faces. Clayt and my dad were good friends in auto business and I am sure they are together working on engines for our Lord. Rest in peace to a gentleman and leader. Very sorry for your loss, Clayt was a great guy, when you pulled into brewers you knew he was coming out with a smile and a joke. He will be greatly missed. My condolences to the family. Becky clayt Jr and family. Clayt was sure a joker and remember the days at classic weekend.we will always have the memories…. He will be truly missed..our prayers are with you and your family….. . RIP CLAYT……..
A man of respect and honor, you will be missed. Our prayers are with you and your family. Thank you for all you have done for our community. RIP Clayt! My sincerest sympathies to his family and friends, Clayt was a wonderful man. We will surely miss his smiling face at the credit union! “there is only one place to get gas in this town and it is at Brewer and Brewer on Broadway”. There would not be a 1/4 Midget race track in Volney if it were not for Clayt Brewer. May his legacy live on. When you think of Fulton, New York – you automatically think of Clayt. He will not be forgotten especially all the lives he had touched one way or another. Our deepest condolences. Such a great man. We are so very sorry to hear of Clayt’s passing. He was such a wonderful man, always had time for you no matter what..we were so blessed to have known him and he will be greatly missed.. He was a pillar of the community and greatly respected by all who knew him. Our deepest sympathy goes out to the whole family.You will be missed, RIP dear man. Yes we will miss Clayt. Honest men that work in politics are hard to find, Clayt was surely one. He lived his life for “The People” I will never forget him or the members of his family I have meet. He will for ever be miss in this community! RIP dear Friend! Clayt was good to many people. I will miss him. He worked hard for many years, Rest in Peace my friend! It brings great sadness to think of Clayt not being there at the station, He always had a smile and always called you hon. I will miss all our discussions about the times we served on the legislature. He loved his time there. May his family find peace with this great loss.